Save Battery power and Data Usage by making sure your phone's WIFI is off when it should be, and on when it needs to be. 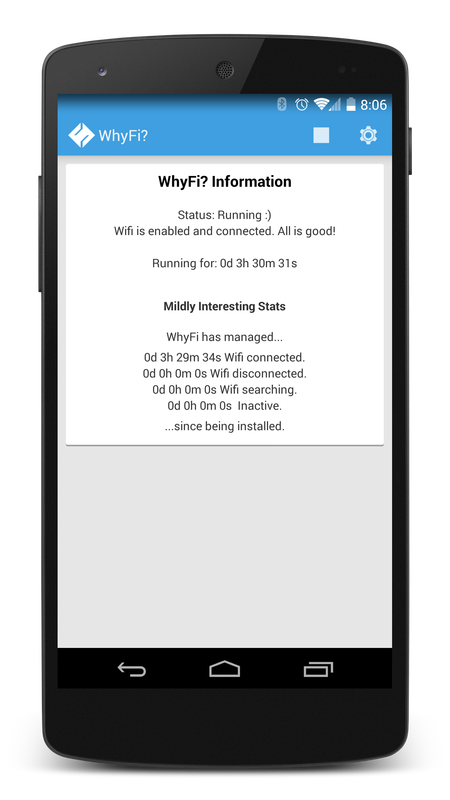 WhyFi is a simple WIFI and Bluetooth manager that aims to quietly manage your phone's resources in the background and save you precious battery power and expensive data usage on your monthly bill. When you are not near a WIFI network, your phone's radios are continuously scanning for a WIFI signal where there may be none. Similarly, if you are within range of a WIFI network, it is much more battery efficient to use WIFI than your phone's 3g/4g radios, as well as saving data. WhyFi provides a range of features to help solve this problem. Clean, minimalist User Interface: See exactly what the app is doing at any time. Complex timing mechanism that intelligently toggles your WIFI radios on and off when WIFI access points come into and out of range. Automatically disable WIFI if your device has been inactive for an extended period of time. On tablets, this can extend battery life by days! Automatic Bluetooth disabling! On some devices, Bluetooth can use a large amount of energy. This feature will disable Bluetooth when it is no longer in use, helping to save that precious battery power. Fully customizable settings: Alter any of the different timings that WhyFi uses to help save you battery life.